Mike Savino has been growing a beard for five or six years. By now, the tangled nest of brown curls extends down to the middle of his chest. 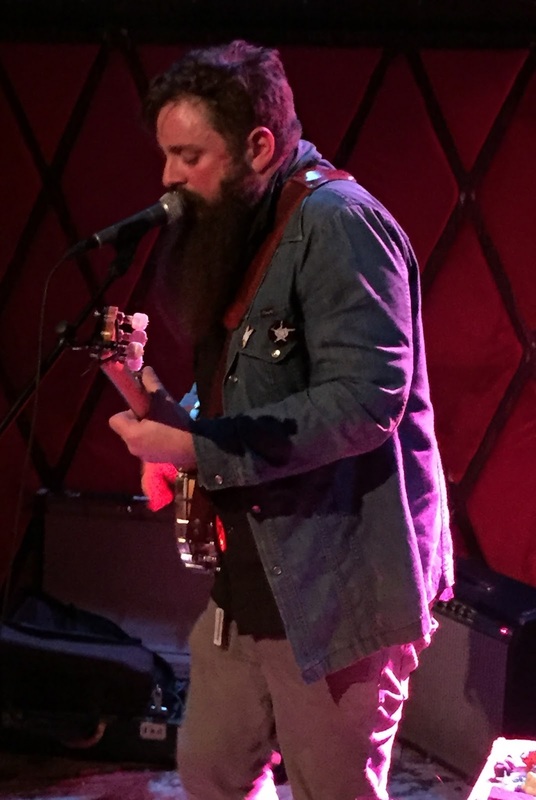 It's the first thing most people notice, but if you'd seen him on Saturday night, it would've been his toothy grin as the capacity crowd at Rockwood Music Hall sang back to him: "I was a seagull / You were an eagle." Just three songs prior, a good portion of this choir had never heard of Tall Tall Trees, the name Savino performs under. While it's a delight to see a musician enjoying himself so much, one of my favorite things to do at a Tall Tall Trees show is to watch people's awed expressions as they first experience the spectacle of what Savino is able to do with a banjo. I should mention that Mike doesn't play an ordinary banjo. His "Banjotron 5000" is a custom-rigged Swiss Army knife of an instrument that he fingerpicks, bows, pounds with a mallet, sings through, etc., effectively transforming Mike into one-man band. In an upcoming podcast interview that we taped before the show, he explained that many of the instrument's features come as a result of him breaking it and re-breaking it. Its latest casualty was its trademark ring of flashing lights, inexplicably stuck on red. "I think it's out of anger," quipped Mike. "It's gonna stay red for a few years, and then we'll have to get the Banjotron back to blue... hashtag." Although he normally performs solo (when not improvisationally sparring onstage with Kishi Bashi), Savino was joined by Ashevillean Micah Thomas on drums. "After four years, I got tired of driving alone," Savino admitted. He introduced "Say Something Real!" as Micah's favorite, the bombastic march of its refrain allowing for Thomas to pound away joyously. The duo had been playing together for less than a week, and it was exciting to watch Mike keep Micah on his toes. During the aforementioned "Seagullxeagle," an interspecies romance that Savino described as "Romeo & Juliet for the David Attenborough set," Thomas stood up at his drum kit, spread his own wingspan, and cawed like a bird. The singalong helped the crowd to loosen up a little in the sauna-like conditions of the small room. "Are you guys ready to have a greasy dance party?" Mike polled the sweaty audience before plunging into the bhangra-informed "Waiting on the Day." Mike's foot missed a pedal during the intro to "Being There," and he decided to restart the number, owning up to it with an "I effed up, bro." The mistake was quickly forgotten as the duo veered the song into a spacey jam, with Savino utilizing a toy megaphone and a laser gun to interact with the Banjotron's electronics. The jam segued into final number "Highwire," Savino again enlisting the crowd for accompaniment on a few takes of its falsetto chorus before Mike and Micah brought it all home with a circusy dirge.